José Luis Hernandez was just 19 years old when he lost a leg, an arm and four fingers of the other hand after falling off of La Bestia, or the Beast, as Central American migrants aptly named the train that leaves the southern Mexican city of Arriaga and travels north to Reynosa, just across the border from McAllen, Texas. Today, José Luis lives with his mother and two brothers in a tiny house in the city of El Progreso, Honduras. This young man’s dream was not very different from the dreams of tens of thousands of Central American youth who each day leave their homes and start the dangerous trek north to the United States. “My goal was to help my family build our own house, maybe even buy a car. I just wanted a better life,” José Luis recounts with such profound sadness that all those in the room are on the verge of tears. “And with that dream I left my home; the dream of helping my family. And here I am a burden to my family. I have a lot of time now to think, and when I think of my mother, how she looks at me and what she feels for me, I know she would give me one of her arms; this is really hard for me,” he continues as his voice trails off. It is estimated that some 400,000 irregular migrants from Central America transit through Mexico each year on their journey north to the United States. José Luis thinks he fell asleep on the roof of La Bestia and simply fell off. He woke up in a hospital where they treated him and fitted him with a prosthesis for his missing leg. 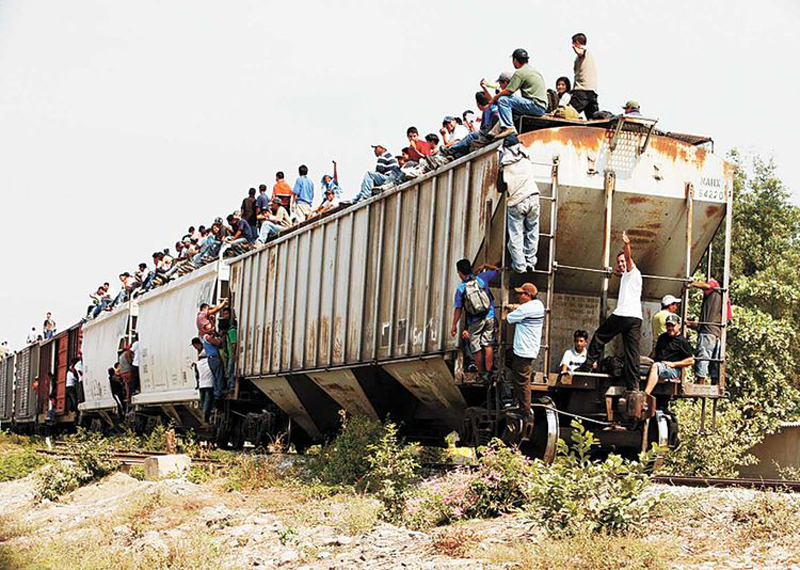 But many others migrants say that if you don’t pay US$ 100 or more to the members of the maras or gangs that hop on and off La Bestia they will push you off the moving train. The stories of threats, robberies, rapes, kidnappings, mutilations, and killings have forced many migrants to take La Bestia’s Pacific route, a 106-hour journey from the town of Lechería, near Mexico City, to Mexicali in Baja California. They call this la ruta sufrida, where they experience more suffering, but it’s the elements and the extra 1,600 kilometers that they must endure. Most say it’s a safer bet than the route where José Luis lost his dreams. “I have a lot to cry about, but I don’t cry anymore. I’ve done all of my crying. Anyways, crying is not going to grow a new leg or a new arm, I just have to keep looking straight ahead,” José Luis says in a somewhat convincing tone. “Sometimes I think this is a fairy tale, but then I come back to reality and say: ‘no, this is real and it happened to me’. I used to play guitar. I liked playing soccer; I was a normal guy. And I lost it all because I dreamt of a better life that I could not find in my own country? If someone had warned me that I could lose one finger, just one finger, I would have never left my home. I want to go on television to tell all young Hondurans not to take the risks I took,” José Luis continues, happy to have an audience to vent. “I have many ideas; I know there are things that I can do to earn some money. I can work in a radio station, for example. Yes, I have many ideas, but they stay inside my head because I have no support,” he concludes his story by inviting his guests to walk outside. que nunca paran de soñar.